8. Tel Rumeida Summer Camp 2007! July 12th, 2007. Nablus in the West Bank is home to approximately 250.000 people, and with its university and central location as a major commercial and educational focal point, it has also been a place which attracts workers and students from other villages and cities in the area. Nablus is surrounded by 35 villages in addition to illegal Israeli settlements such as Itamar, Berakha,and Alon Moreh, and Yitzhar. northeast, and Badan to the east are all used as means of collective punishment. The Badan checkpoint especially, has made itself famous for the arrogance and harsh behavior with which the IOF meet the Palestinian population. Long delays, often for hours on end in excruciatingly hot temperatures, without any possibility of getting away, turning back, or finding shade. checkpoints. At 7.30 the Badan checkpoint was in reality completely closed, and 10 minutes later the checkpoint suddenly opened up, thus slowly allowing Palestinian cars to go through the checkpoints manned by the IOF. The ISM-team observed and intervened when the IOF forced 4 of the Palestinian men waiting by the checkpoint to carry large boulders in order to further fortify the checkpoint, and prevent cars from approaching the soldiers from more than one lane. return to the bus. After standing outside in the heat for 40 minutes, the remaining men could get back to the bus. However one exhausted man was taken to a metal booth and was made to sit on a boulder in a very uncomfortable position. The ISM-team managed to approach the man, and had him whisper his name and ID-number so that steps could be taken to secure his identity and prevent him from “dissapearing” into the Occupation Forces administration. We also made sure to get the phone number of his parents, and put Machsom Watch and Hamoked in touch with the DCO. It was now clear that the young man would not be released within the near future. The soldiers claimed his was one of the wanted men on their list containing 167 numbers. Each number is the last four numbers in a Palestinian ID-number and everyone on that list is wanted and to be arrested. Time passed and the heat and position weakened the man and he was barely conscious at some points. The activists were allowed to give him water, but no food and absolutely not talk to him. After nearly 2 and a half hour in detention his condition was just getting worse, but the soldiers kept repeating that this was a dangerous man and not the 18 year old student that he really is, and refused to do something about the situation. When almost 4 hours had passed and the soldiers started to become disturbed by the international presence and the repeated reminders of what human rights violations they committed, the internationals had to leave in order not to escalate the violence. An hour after that, the man was taken away, still under arrest. Approximately 50 Palestinians, Israelis and international solidarity workers united for another Friday non-violent march in Wadi-Al-Neiss, a village south of Bethlehem which, along with nearby Um Salamuna, is among the many regions suffering from land confiscation due to the illegal Israeli Apartheid Wall. Marchers convened and attempted to walk on stolen lands, lands illegally taken by the Israeli expansionist regime. The internationally illegal Israeli settlement of Efrat, a long and extended expanse of stolen land, designed to appropriate as much land as possible, snakes through Palestinian property, effectively dividing up the land and stealing precious water. The march occurred just days after the 3 year anniversary of the International Court of Justice ruling denouncing the Apartheid Wall as internationally illegal and calling for the cessation of construction, along with due compensation to Palestinians affected by its construction. One Palestinian from the Local Popular Committee of Land Defense and one of the organizers of the non-violent march, was arrested as he stood unarmed among peaceful demonstrators. Fines for such unwarranted arrests range from 3,000 to 7,000 NIS. The attempted march lasted for approximately 1.5 hours, during which time marchers attempted numerous times to cross onto annexed agricultural lands. In between attempts to walk on the stolen land, during which armed soldiers used some force against unarmed protesters, resulting in at least 5 minor injuries, solidarity activists made numerous attempts to engage in dialog with soldiers on human rights issues, Israel’s violations of international law, the illegality of Israeli settlements in the West Bank and of the Apartheid Wall, and the need for Palestinians to be able to access their own lands, much of which are income and food-providing agricultural lands. Marchers left as peacefully as they arrived, with renewed promises to demonstrate against the illegal land-grab and to reach the Israeli-annexed Palestinian lands. July 13th, 2007. Approximately 40 Palestinians, Israelis, and international non-violent marchers met for another Friday attempt to access stolen Palestinian land in the village of Artas. As in previous marches, unarmed solidarity activists were met by approximately 15 armed Israeli soldiers who refused passage to the Israeli-annexed Palestinian land. Throughout the demonstration, during which the halted marchers sat to listen to Artas Popular Committee member Awad relate the history of Artas’ annexation, at least one Israeli soldier maintained targeted aim with live ammunition on the clearly un-armed crowd below. Artas, like Um Salamuna, suffers from the devastating effects of the Israeli Apartheid Wall, annexing land and water sources, and the extended illegal Israeli settlement of Efrat. While Efrat divides Palestinian lands leading up to Artas, the villagers of Artas will lose their agricultural lands to Efrat’s sewage: the settlement has plans to empty settlement waste directly onto the olive and fruit orchards below, and further onto the vegetable gardens which provide sustenance to the 4,000 villagers. Awad described how the valley normally would flood with water at certain times of the year. “One year from now we won’t see this valley; it will be ruined by sewage,” he predicted. While the marchers were not able to cross onto the stolen lands, their time was well-spent in showing presence against the illegal land-grab and provided an opportunity for numerous speakers to voice their thoughts. Among the speakers was a long-time American activist, who spoke of the parallels between the treatment of Native Americans by US colonialists and that of Palestinians by Israeli colonialists, directing many of his comments at the armed Israeli soldiers within earshot: “In the US, the army went through Native American communities, destroying and killing. When the Native Americans resisted, they were called ‘savages.’ They were made to seem less-than-human. The non-violent march and meeting ended with further words from the organizers and a peaceful march back to Artas village. July 13th, 2007. 100’s of internationals, Israelis and Palestinians marched against the apartheid wall which has annexed over 50% of the village of Bil’in’s land on Friday. As usual the demonstration was met with Repression from the Israeli Occupation Forces. Three injuries were reported, an unidentified French activist suffered from severe tear gas inhalation, Iyad burnat suffered a burnt hand, which was burnt by a tear gas cannister hitting his hand and Mustafa Khatib suffered from tear gas inhalation resulting in him passing out and having to be carried to the back of the demonstrations by medical personnel. July 11th, 2007. At 23.30 two Human Rights Workers (HRWs) and four Israelis were at the house of a Palestinian man whose house is being rebuilt after it was vandalized by settlers. The HRW’s and the Israelis have been sleeping in the house for the last week to prevent further attacks from the settlers in Tel Rumieda. Tonight a female settler entered the Palestinian’s land and stole a sign which read “private property”. The Israelis tried to talk to the female settler but she ran away, up to the settlement where she was supported by other settlers and soldiers. The Palestinian owner of the house called the police and within ten minutes six policemen were at the scene. The settlers claimed that part of the land belongs to them, and that the Palestinian man is only allowed to use some parts of the land. The female settler, accompanied by other female settlers, continued shouting: “ He cannot go further than the terrace”. The Palestinian man asked the police if it was possible to sit down and discuss the situation. They did this outside in front of the house. One of the police officers suggested that the Palestinian man lay a complaint at the police station, right away, and then to “be smart, not right” until the Israeli court passes a judgment on the borders of the land. Things might escalate and to prevent further attacks and potential violence it is better to take a step back. This is a seemingly odd statement considering that it is the settlers, not the Palestinian man, who are carrying guns. July 11th, 2007. 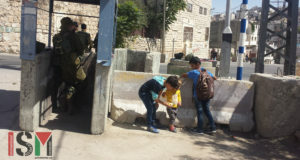 At approximately 5 pm a group of IDF soldiers pointed their guns at 4 children on Shuhada street. The kids where afraid of the soldiers and hid in their home. The soldiers ran after them and pointed their guns at them while shouting “we will shoot you”. The children’s family is living in one of the houses right next to the Beit Haddasha settlement and their house has been attacked by settlers as well as threatened by the IDF on several occasions. The Tel Rumeida summer camp starts on July 14th and runs until July 28th. It will begin on the first day at 9:00am beside the Qurtuba school within Tel-Rumeida. All the events are still being scheduled and will be posted once that information is available. To have any of your questions answered about the summer camp please call Fawaz (0599672529) or Issa (0599340549). See you there! July 10th, 2007. At 11:25am two international human rights workers were hanging up posters around the neighborhood of Tel Rumeida for a children’s summer camp due to begin at the end of the week. The posters are designed to make Palestinian children, within Tel Rumeida, ages 5-14 aware of the event so that they will attend. The internationals had been hanging up posters for forty-five minutes, down Tel Rumeida hill, and on Shuhada street, when they reached the stone-staircase across from Beit Hadassah settlement. The internationals hung up a poster on a stop sign right before the stone staircase. The Israeli soldier present said nothing to either international although he obviously saw the internationals hang up the sign. The internationals then proceeded to walk up the stone staircase, to hang up more posters, when an Israeli settler began to yell at the soldier about the poster hung up on the stop sign. This settlers name is Atan, he lives in Tel Rumeida settlement, and the internationals have had many problems with him in the past. The soldier told the internationals to stop, and ordered them to come down the stairs. The internationals asked why the soldier would listen to the settler, and that the posters were for a children’s summer camp. The soldier did not respond as the Israeli settler, Atan, continued to yell at the soldier. One international offered to take down the sign since it seemed to have caused a disturbance and he wanted to proceed hanging up posters without interruption. When the international tried to take down the sign, however, Atan pushed the internationals hand out of the way. The settler then dropped his shoulder into the internationals chest and pushed him back. The soldier present did nothing about this, and then told the international to leave the poster hanging up. It then became obvious that they, the Israeli soldier and settler, wanted to use the poster as evidence that the internationals had broken some kind of law. It was then that a plainclothes Israeli showed up, and briefly flashed an id at the internationals telling them that they were detained until the police would come. He told the internationals that he had pictures of them and that if they left they would be arrested by the police. He refused to speak English to the internationals until they tried to leave, and then would make sure to tell them, in English, that if they left they would be arrested. The internationals at that point were forced to wait, and they both assumed the man was Shin Bet. The Israeli man spoke freely with the soldier, and when a new group of soldiers arrived, who were in training, the Israeli man had long discussions with the Israeli Occupation Force (IOF) commanders. He seemed to be respected by every Israeli or settler immediately, which is why the internationals assumed he was Shin Bet. After about 15 minutes the police arrived and began filming the stop sign, with the poster, and the two internationals. They also took the internationals passports. The Israeli police also told the internationals that it was illegal to put up signs on public property and that they would be investigated. This claim was completely absurd as one can see settler posters and propaganda all over the Tel Rumeida neighborhood. The time at this point was about 12:20, and the internationals had called multiple Israeli groups and Palestinian friends about their situation. It was obvious that it was the poster on the stop sign that had caused the whole disturbance, and though the internationals had offered to take down this poster multiple times the police told them to leave it hanging. The police officer then told the internationals to get into the back of the police jeep because they were going to be investigated. The internationals at first refused to get into the police jeep because they feared they would face an absurd charge and be arrested. The policeman began to say, however, that the internationals were resisting arrest, and the internationals finally complied to go into the police jeep. By the time the internationals arrived at the Kiryat Arba police station they had called everyone they knew about their situation and what they might be charged with. They found later, after about an hour waiting at the police station, that they could be arrested on charges of putting posters on public property which is supposedly illegal under military law in the occupied territories. However after about two and half hours, at 2:30pm, the internationals were released without charges. They had given their statements, and the police investigator told them they would remain under investigation. He also told the internationals that they should not make any more problems in Tel Rumeida. The police investigator also told them that they could hang up more posters but only on houses on which Palestinian families allowed them to place posters. The internationals then walked home to Tel Rumeida. When they arrived on Shuhada street they noticed that none of the posters were left on the walls. At this point it was about 3:00pm. 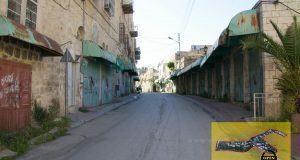 They discovered, from the internationals present on Shuhada street, that the Israeli settler, Atam, had taken down all the posters on Shuhada street and up the hill. One of the internationals, who had gone to the police station, stopped Atam, as he was driving, by standing in front of the van. The international quickly yelled at Atam that he had no business taking down their posters, while another international asked “why do you have so much problems with kids?” Atam just shrugged and drove away to an Israeli police officer, stationed at the end of the street, and complained to him about the international stopping his van. When the policeman arrived he took the internationals information, and told them that it was illegal to put up anymore posters because the picture was inflammatory to the State of Israel. One side of the picture depicted a young girl with barbed wire across her face. Some of the barbs were in the shape of the Star of David. The policeman told them that the Israeli settler, Atam, had every right to take down the posters because they would incite the settlers, the army, and all Jewish people. He would not admit that the violent settler graffiti littered all over Tel Rumeida, including “Gas the Arabs”, is much more repulsive and inflammatory than these posters. The policeman told the internationals that they could hang up posters around the neighborhood but not these posters due to the Stars of David. July 10th, 2007. At midnight the Israeli Occupation Forces (IOF) invaded Nablus with 75 vehicles from all different directions. They entered Balata refugee camp and the Old City of Nablus. During the night 7 men were arrested in the old city. At 5 am, the IOF moved on to the Rafideh neighborhood with the aim of arresting 2 wanted freedom fighters in the area. Half an hour later the soldiers went into a villa, interrogated the 6 people living in the house, showing maps of the neighborhood and pictures of the wanted men, clearly knowing who they were looking for and where they could find them. At the same time they surrounded the civilian apartment complex situated next to the villa. The soldiers started to fire their guns and throw grenades and sound bombs in the street in order to wake up people sleeping in their homes. When the residents did not respond to their demands to open the door the soldiers blew up the front door. They forced the 70 people in the house out into the street. All the men had to show IDs and then go through the humiliating act of taking off their clothes in front of everyone. After that women and men were separated and the approximately 20 men in the group were taken to the nearby villa for detention and interrogation. Since the wanted men were not among the men in this group the IOF started to place bombs around the apartment complex with the intention to blow up the whole building in case the wanted men would not turn themselves in. At this point the two wanted men and the apartment owner that hosted them exited the house. They were handcuffed, blindfolded and then brought to the villa, where they were tortured. When the ISM team arrived at Rafidah they tried to approach the occupied buildings with no success. Shortly after that, the IOF left Rafidah with the 3 arrested men. After that the ISM activists were let into the apartment of the now arrested man. The apartment was completely torn to pieces. The soldiers had gone berserk, ripped up all the furniture, emptied drawers and closets, throwing everything on the floor including the children’s toys and school material. Basically, the soldiers wrecked everything in the family’s house. July 9th, 2007. As a part of the summer campaign 12 International Solidarity Movement (ISM) activists visited the Till village to help the local farmers reach and cultivate their land. The fear of being shot or having their tractors confiscated has made it impossible for the farmers to reach parts of their land. In addition, thanks to an Israeli law, Palestinian land that has not been cultivated for 3 years may be confiscated by the state of Israel. At 9am in the morning the ISM activists arrived to Till where they met the local farmer Forsam and his family. Forsam has not been able to reach his land in 4 years, out of fear of being shot by the military from their outpost which is located only 200m from his land. The aim of the action was to plant 20 olive trees in 2 hours. The ISM activists task was to make sure the Palestinians could move safely to, on and from their land, which is located inside a closed military zone. The action was a big success, 20 olive trees were planted in less then an hour and the military did not intervene. This successful action will hopefully lead to more Palestinians being able to access their land during the actions occurring on future days. This morning the streets of the town of Kofor Ra’ai in the district of Jenin were almost empty except for people and families waiting on both sides of the street for transportation. It was a weird situation with no vehicles driving at 11 in the morning but it was obvious that there was a nearby checkpoint blocking cars from passing. I was traveling for my first day at university in Jenin after a break of three weeks for the summer course, but my trip lasted for three hours which is four times more than a normal day. After thirty minutes waiting side the street, a mini bus arrived and I was lucky to get the last seat at the back. Just few minutes outside the town, an Israeli mobile checkpoint of two jeeps were stopping and checking vehicles in both directions of the road. Finally it was our turn after one hour of waiting! One Israeli soldier motioned to our driver to get closer and told only males to get out of the bus and get our ID cards out. Two soldiers were already occupying a roof of a house by the street; I could only see the barrel of the gun of the soldier from where I was standing. After five minutes, anther soldier asked us to walk forward and form a line. In an aiming motion, he was pointing his gun at each one of us slowly and one by one. It felt like he was looking for someone to shoot at. The soldier aims at each old man and tells them to go back to the bus. One of the Palestinians who was with us said that, this checkpoint was for students who are traveling to their universities from home after the break. The same soldier was keeping our IDs on the top of the jeep; he looked at one ID while keeping his gun pointing at us and asked the first Palestinian who was about 19 years old to walk towards him. Immediately, the soldier told the young Palestinian in Arabic to turn around and lift his shirt up. The young Palestinian was detained! 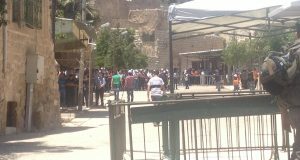 While we were standing there mumbling from the heat, a small yellow taxi jumped over a queue of approximately thirty Palestinian vehicles in order to bring an old sick man through the checkpoint. The two soldiers on the roof of the house yelled loudly at the driver to go back and wait in line. The driver was waving and trying to address to the soldier that he has a sick person. The soldier cursed him in Arabic and told him to move back. A big soldier approached to see what was happening and said in Hebrew to the soldiers on the roof “maybe he has a patient” then he motioned to the driver to go to the checkpoint. Meanwhile, an old woman who was apparently a relative to the sick person was trying to speak to the first soldier. The soldier on the ground behaved like if he was a doctor, checking the old person and asking him questions, it was obvious that the old sick man was unable to move and leaning his head against the person next to him. The detained Palestinian was released after twenty minutes and interrogated by the same big soldier who checked the patient. The soldier confiscated the boy’s wallet and cigarettes, we all thought that the army was going to arrest him and leave which is an ironic tactic that the IOF (Israeli Occupation Forces) uses at checkpoints to round up random young Palestinians. The soldier gave only 10 shekels and two cigarettes back to the boy and stole the rest. When the boy asked him about the rest of his stuff, the soldier replied that what he gave him is enough for a boy!! Was that soldier asking for more money and cigarettes from the old sick man too?! The soldier looked confused and didn’t hear so I replied “This is a horrible checkpoint!” then got on the bus immediately. After we all were in the bus, the officer came to my window and said “You are not in a position to tell us what we should do at the checkpoint, ok!” the officer didn’t wait and walked away! July 8th, 2007. At about 4:30 pm an international human rights worker (HRW) was sitting at the top of Tel Rumeida hill with three Palestinian children. The HRW noticed that the Israeli soldiers were playing with their guns. The soldiers were pointing them at children, playing air guitar with the guns, and taking photos of each other while doing this. The Palestinian children went inside because they were obviously uncomfortable. Two policeman were present at this time, around the corner, but did not say anything to the soldiers. A six year old Palestinian boy then came up the hill, and the soldiers pointed their guns at him. The Palestinian boy immediately stopped because he was obviously afraid. The soldiers then took down their guns and the Palestinian boy passed. The HRW then spoke with the young boy, and asked him how he was. The boy explained that he was fine. The HRW then spoke with the soldiers and asked them to stop playing with their guns and pointing them at children because they were obviously being reckless and scaring children. One soldier replied that he would stop, while the other was sarcastic and made fun of the HRW. The soldiers did not point their guns at any more Palestinian children after the HRW intervened. July 7th, 2007. At approximately 6:00 pm, two Palestinian boys were being detained at the checkpoint dividing Shuhada street in Tel Rumeida, H2, and the market in H1. Inside the checkpoint two Israeli soldiers were accompanied by a civilian settler who clearly took their attention away from their task. The HRWs approached the Palestinian boys to find out why they were being detained, but no reason had been given to them by the soldiers. At approximately 6:25 pm, as the HRWs were speaking to the Palestinian boys outside the checkpoint, one of the soldiers shouted at them, demanding their passports. The HRWs continued speaking to the Palestinian boys as the soldier announced that he would call the police. At approximately 6:30pm a third HRW arrived and two observers from the Temporary International Presence in Hebron (TIPH). The Third HRW approached the soldiers to ask about the two Palestinian boys, but the soldier, now seemingly willing to speak to internationals, answered by explaining why the two Palestinian boys were being detained to the HRWs. A jeep with two officers from the Israeli police arrived at 6:40pm. They asked the HRWs very briefly about the situation and took their passports. The soldiers and the civilian settler were given plenty of time to explain what had happened. At approximately 6:55pm the detention of the two Palestinian boys was addressed and they were let go. The two HRWs were taken to the police station in Qiryat Arba for having refused to show their passport when ordered to do so. At the police station the soldier who had shouted for the passport, who was now carrying the passports, was being heard from 7:15pm to 7:45pm. After this the HRWs were heard, one at the time, for 30 minutes each. At 9:20pm they were taken back to Tel Rumeida.